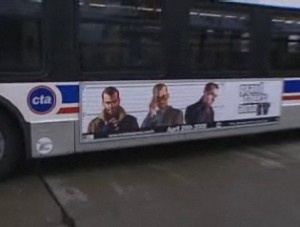 The Chicago Transit Authority has decided to remove a Grand Theft Auto IV advertising campaign from its buildings and buses after Fox News equated the ads with "an especially violent weekend" in the city. GamePolitics has uncovered the decision, which came following attempts by Fox to contact CTA President Ron Huberman about the ads. Although Huberman would not speak to Fox on camera, a representative of the transit authority eventually responded to Fox inquiries about the advertisements by saying they would be coming down. This is the second time the CTA has generated controversy as the result of a Grand Theft Auto ad campaign. In 2004, Illinois Governor Rod Blagojevich, who came under fire in 2007 for blowing $1 million of state government funds in a doomed attempt to enact legislation against the sale of videogames, criticized the Authority for running a campaign for Grand Theft Auto: San Andreas. Those ads were also pulled, although the CTA claimed the contract for those ads was nearing its end anyway. Huberman's spokeswoman pointed out that Huberman was not the president of the CTA at that time. In late 2006, Boston banned ads for M and AO rated games on its buses as well, a decision prompted by complaints from the Campaign for a Commercial-Free Childhood about bus advertisements for Grand Theft Auto: Vice City Stories.